I have a hard time deciding which season is my favorite - summer or fall. The abundant sunshine, time at the pool, beach vacations, and fresh fruit everywhere make me love summer. But I love fall because I can wear jeans and boots, football season, the lack of humidity and 100 degree temperatures and anything with apples and cinnamon so it's a tie in my mind. But while summer is here, I love to take advantage of all the fresh fruit that is in season. The grocery store is full of cheap, fresh, local fruits that are delicious. Why not use it to make a super simple, healthy side dish? This fruit salad is the result of a Kroger sale on fresh berries last week and some gorgeous cherries that I had to buy. It would also be good with the addition of fresh pineapple, kiwi, grapes, apples, etc. Really anything goes, just add what you like. 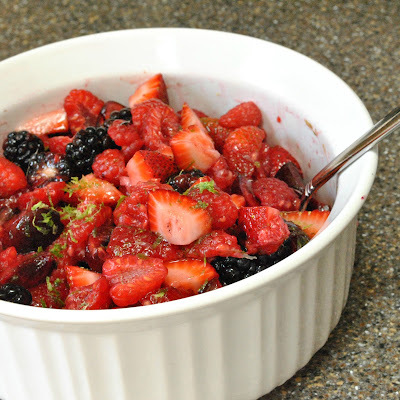 This is perfect for a summer potluck or picnic too since it doesn't require refrigeration. It's great for adults and kids, although remember that it is recommended that kids under one year of age shouldn't have honey. My toddler absolutely loved this, but I did make sure I chopped the fruit a bit smaller than I normally would have if it was just being served to adults. This also makes for a great dessert spooned over vanilla ice cream or with a dollop of whipped cream if you are going for a healthier option. In the bottom of a medium size bowl, whisk together lime juice, zest, and honey. Add sliced fruit and gently stir to coat with sauce. Refrigerate for at least one hour to allow the flavors to combine. The juices from the fruit will add to the sauce as well. Stir gently just before serving. This looks so good! I could go for some right now! Looks delicious!!! Cool, light, refreshing. This is something anyone could eat!